In this article we describe how to activate feature that allows Share Views with external users in On-Premise environment. We list pre-requirements and limitations of the solution as well. On-Site customers can install this mashup from the Mashups Library to activate it. Only Targetprocess administrators are authorized to perform these actions. Navigate Settings > Mashups for this purpose. Please make sure that the local copy of the Mashups Library matches your currently installed Targetprocess version. Best practice is to install most recent version of Targetprocess and then update Mashups Library from our public GitHub repository. Otherwise you may encounter version incompatibility issues. Then install Share View mashup from the library. 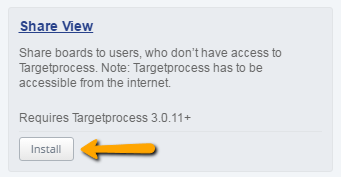 Refresh the page with Targetprocess application in web browser so that the settings are applied. Request other users to do the same if they want to Share Views immediately. The server that hosts the Targetprocess application should accept incoming connections established from our tauboard.com web server on the Internet. In the IIS settings, the Targetprocess web application should be set to support Anonymous and Forms authentication mode. In addition, Windows authentication mode should be disabled. The Share View mashup uses token-based authentication which is incompatible with the Windows authentication method. If a secure HTTPS-only mode is activated for your Targetprocess application, there will be an access issue with certificates that should be addressed explicitly. If a Single Sign-On feature is activated for an On-Site account, then an exclusion should be created for Share view mashup requests. Unfortunately, you will not be able to connect to the Share View service if your Targetprocess application is hosted within an isolated local network and doesn’t have a direct connection to the Internet. Contact our Support Team if you require any assistance with activating the mashup.